You can spend hours scouring Pinterest and Houzz looking at pools and dreaming, but when it actually comes to planning for YOUR pool things start getting really overwhelming. There are so many decisions to make and things to consider. Your brain starts going a million directions and it is easier to just put it all off for another time. But, now is the time to get your thoughts organized so you can have the pool of your dreams. We are here to help. We put together a list of some of the biggest things that you should consider when installing a pool. Once you start to seriously plan your pool, the first thing you will need to decide is what type of pool you want. Will you choose fiberglass or a vinyl liner pool? Fiberglass pools cost more upfront, but they are a great low maintenance option that won’t incur as many costs in the long run. 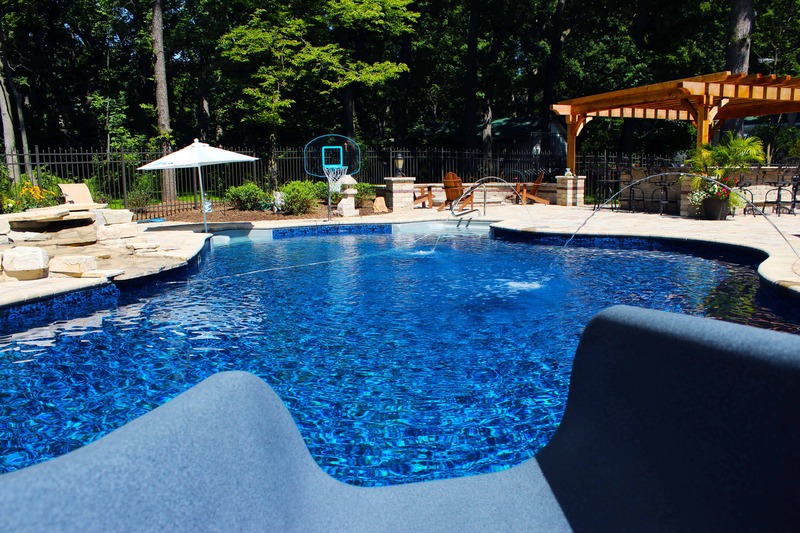 Fiberglass pools are made off-site from preformed molds, which limits your design options a bit, but means that you get a faster installation. A Vinyl liner pool has a lower cost initially, but you will need to replace the liner every 7 to 15 years. Vinyl liner pools are totally customizable. They are built on site in your yard, which takes longer, but means that they can be larger than a fiberglass pool. There are definite pros and cons to each type, so you are going to want to do your research. Deciding on the size of pool you want to install, will kind of go hand in hand with the type of pool you choose. How big your pool is going to be will be determined by several things. One of those things is the type. Fiberglass pools are limited to 16 ft. wide because they are made off site. If you choose fiberglass it will play a role in how big your pool can be. The size of your yard will also be a factor. Do you want to take up the majority of your yard or would you prefer a smaller pool so you still have green space? Cost will also be a factor in how big your pool will be. Obviously the cost of your pool will go up as the size increases. These are all things to consider as you determine how big your pool will be. Now that you have taken care of the logistical aspects of your pool you can start thinking about design features. There are tons of different features that can be added to take your pool from an everyday pool to a pool that wows. Do you want a tanning ledge, a waterfall, maybe fountains? Thinking about adding a diving board, a slide or sports equipment like a basketball goal or volleyball net? You will most certainly want to consider an automatic pool cover. Yes it adds cost to your initial investment, but the security and convenience that it provides are well worth it. The features that you choose upon installation will affect how much you enjoy your pool. As you are planning for your pool, also plan for the area around your pool. Maybe a patio or some kind of decking? Think about how wide of an area you want around your pool and how your pool area will transition to the rest of your outdoor space. Considering what kind of seating options you want around your pool is a good place to start when deciding what your pool surround will look like. Finally, plan for some landscaping around your pool area. Your pool will be beautiful, and the right landscaping will go a long way to enhance it. As you pick plants, consider things like shade, and if the plants will cause landscaping debris that could get into the pool. Do you want your plants in the ground, in pots or a combination? All of these things aren’t necessarily part of the pool, but they will play a huge part in how your pool looks. There is a lot to consider here, but using this guide to get your thoughts organized can be very helpful. If you are still in need of further guidance or if you are ready to get the ball rolling, bring your ideas out to the showroom. Our friendly, knowledgeable staff would love to turn your dreams into reality.